In his second season with FGO, Mr. Colclough appeared last season as the Mandarin in Turandot, Wolfram/Schlémil in Les contes d’Hoffmann, and Inconnu/Carbon in Cyrano. He started his career at Los Angeles Opera in 2008 being directed by film legend Woody Allen in Puccini’s Gianni Schicchi. Mr. Colclough portrayed the role of Guccio followed by the Imperial Commissioner in Madame Butterfly. Last season at LAO he portrayed the Sargeant in Il Barbiere di Siviglia as well as the Third Senator in the American premier of Die Gezeichneten). 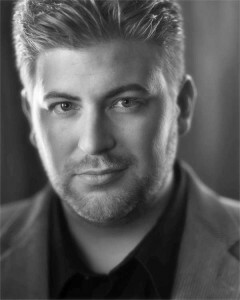 In 2008 he was a National Semi-Finalist at the Metropolitan Opera National Council Auditions in New York. Additional past roles include Don Giovanni, Papageno, Oroveso, Samuel in Un ballo in Maschera, and Mr. Lindquist in Sondheim’s A Little Night Music. He has been a guest artist with the Pacific Repertory Opera and Performance Riverside Civic Light Opera and a soloist with the Israeli Symphony Orchestra, the California Philharmonic, and the Redlands Symphony. He has also recorded at Capitol Records, Los Angeles, and Abbey Road Studios, London.